Description SNEK Cycling (pronounced sneak) is defined as sleek and neat. Someone or something of good taste or stature. 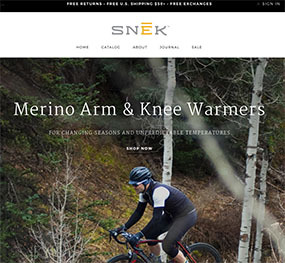 SNEK Cycling is a brand based upon stylish, simple, and authentic cycling goods. Every SNEK product has been handcrafted and designed in the USA. Their collection of cycling goods feature merino wool arm/knee warmers and wool cycling caps designed to keep you warm and comfortable in the harshest cycling conditions. SNEK Cycling's Influencer Marketing program is now available on the Fervora platform. The program is intended to be an easy way for brand advocates and influencers who know and love Snek Cycling products to refer like-minded cyclists to the website and get rewarded in the process. Through this program, Snek Cycling will pay you a commission for every unique visitor or sale referred to our website. The best way to refer folks is through word-of-mouth or social media. All that’s needed is your custom hashtag for tracking. If you prefer word-of-mouth we recommend providing folks with your hashtag or adding it to a business card. It’s as easy as -snekcycling.com/#brian – My unique hashtag is “Brian.” You can also feel free to post your link on Facebook, Twitter, or Instagram. Signing up is easy. Follow these steps and you’re in!